Australian open will be the first grand slam tournament which will be held at Melbourne Park, Melbourne Australia on January 2012. This article gives you complete information about the schedule, ticket price and booking tickets online for Australian open 2012. Prize money for each rounds in Australian open are also quoted in this article. Read the article full for more details. Australian Open 2012 will begins from January 16 2012 and ends on 29th January 2012. Australian open will be the first grand slam tournament which is scheduled to be held at Melbourne Park, Melbourne, Australia. Rod Laver Arena, Hisense Arena and Margaret Court Arena are the main courts for Australian open 2012. Men's singles and Women's singles will be the main events in 2012 Australian open. There will be qualifying rounds before the start of Australian open. First round of the Australian open 2012 starts from 16th January 2012 followed by second round, third round, quarter finals, semi finals and finals. More details about the Schedule of Australian open 2012 Men's singles and Women's singles are given below. Prize money for Australian open 2012 will be the highest and record prize money in the history of grand slam tournaments. Prize money for the winner of Australian open 2012 will get $2,300,000 and given 2,000 points. Prize money for Runner up in Australian open 2012 will get $1,150,000 and 1400 points. Players who reach semi finals will get $420,000 plus 900 points and Quarter finalists will get $210,000 and 500 points. Players who lose in 1st round of Australian open will get $20,000 and 5 points. 2nd round losers will get 100 points and $32,000, 3rd round losers will get $54,500 and 160 points. Players who lose in round of 16 will get $93000 and 280 points. Prize money is also given in qualifying rounds of Australian Open 2012. Players who lose in 1st round of qualifying matches will get $2,860 and 2 points. Second round losers in Qualifying rounds will get $5,710 plus 40 points and 3rd round losers of Qualifying rounds will get $11,440 and 50 points. Australian Open 2011 takes place in two stadiums which includes Rod Laver Arena and Hisense Arena. 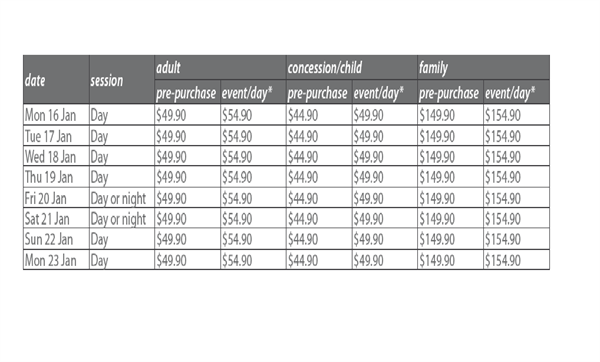 Australian Open 2012 ticket price will differ according to the stadiums and seating's. Australian Open 2012 will starts from 16th January 2012. Tickets for Australian Open 2012 is already on sale. Ticket price for adults and children will differ. Tickets can be pre ordered or can be purchased during the event or day. If you pre purchase the tickets for Australian open 2012, you will get the tickets at a lower price and event/day tickets price will increase. 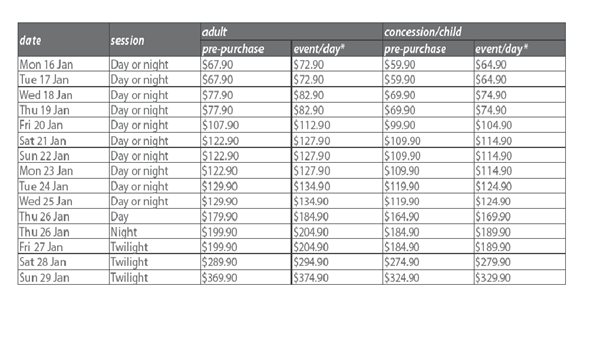 More details about the ticket price and ticket limits for Australian Open 2012 are given below. How to book Australian Open 2012 tickets? You can book tickets for Australian open 2012 through online. Many websites are already active for the sale of Australian Open 2012 tickets. Ticket price may vary according to the stadium and rounds. The lowest ticket price for Australian open 2012 includes $44 and highest price includes $374. Get Australian open 2012 tickets online from the websites given below.